Could not be happier for Roger Federer. A class act, a gracious master ; and now, indisputably, one of the greatest of all time. Good for you, Roger. Oh and love the new camera angle NBC had on the French Open. It was from behind the guy receiving the serve, so it looked like the viewer was actually trying to return the serve. It showed you exactly how ridiculously fast the ball is coming at the guy trying to return it. 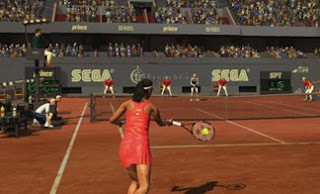 loved the angle—more of it—even if you did probably lift the idea from Sega Tennis. Great analysis by the YES broadcasting team on Texiera's influence on the Yankees defense. They showed how much larger Texiera's range is than Jason "Frankenstein" Giambi's was. And how that allows Cano to position himself closer to 2nd base. And then how that ripple effects to Jeter, who can play more in the hole. The Yankees have moved from back of the pack defensively, last year, to the upper middle of the pack. And Texiera replacing Giambi, has no small part to play in that. Nice to see Jeremy Shockey taking his off-season after a disappointing first season with the Saints seriously. I am officially of the Fausto Carmona bandwagon. And that goes for Francisco Liriano as well. And I am officially back on the Eric Bedard bandwagon. People were so down on him last year—it seemed odd to me that Seattle gave up on him so quickly—but he always had No. 1 starter stuff. Now he's healthy and Seattle has 2 potential no. 1 's in their rotation with him and King Felix. Yet another article about whether to put Joba in the pen or not. At least this one, with all its calculations and theories, should put this argument to rest. Leave him where he is. Word is that the Braves fleeced the Pirates in the Nate McLouth for 3 nondescript prospects trade. One scout said, "How the heck do you trade one of your your best player and not get an A-type prospect in return?" One answer: It saved the Pirates 15.75 million dollars. McLouth was signed through 2011 and was due 15.75 million guaranteed. And with the Pirates dead last in the MLB in fan attendance in this down economy (avg attnd: 16, 588; meanwhile the Cardinals average 40,144, the Brewers 37, 389, the Cubs 38,529), and with a very cheap rookie alternative in Andrew McCutchen, the Pirates felt they had to cut costs. The unfortunate reality of this is that, even with the Pirates treading the .500 line for the first time since George Bush Senior was in the White House, this trade sends a terrible message to their fan base. Or what's left of it. The Sporting News wrote a list ranking the 32 head coaches in football today. And no offense to John Harbaugh, who had a fantastic first season with the Ravens, but how does he rank higher than Tony Sparano. 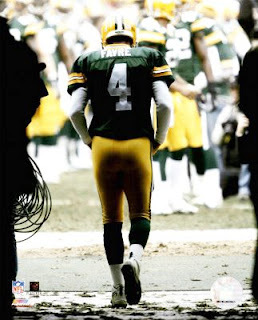 The guy brought a 1-15 team, with a lack of talent at a ton of positions, and with a new, weak-armed QB all the way to the playoffs. And he brought in a bunch of new rookies and placed them in important positions and they fared well. Sorry, but in my book, Sparano deserves to be much higher. Incredibly surprised that the Panthers were unable to trade Julius Peppers. The man had a career-high 14.5 sacks last year. You would think that somebody would offer something for the man and then renegotiate his contract to a long-term deal. And finally, for the last time.. ..we mean it.....Brett. Go. Away.